A little introduction to my friends Anthony & Geoff. Co-Built Motorcycles produce some of the highest quality motorcycles (and parts) around. They’re not too bad at racing them either. The video was shot at Rye House in Hertfordshire and at the Co-Built HQ in Oxfordshire, England. Can you tell me a little about you and your background? I have been racing motorcycle since I was 14 in one way or another. My father has alway raced motorcycles or cars so it runs in the family. Geoff mainly rode BMX when he was a kid but his dad was a real keen motorcyclist. Between us we have most types of motorcycle sport covered. Enduro, MX , Rallyraid, Grasstrack, flattrack, roadracing, trials we even rode an MX sidecar for a while. Who out there influences you? Currently some of the great companies around like Dues and Wrenchmonkies but also in the past the owner/racer companies that have helped to shape motorcycling like Alf Hagon, Don Godden, Tig Perry. What was the first bike you ever owned? A Honda Express moped. I used to slide it around my mates field. How long has Co-Built been in around? 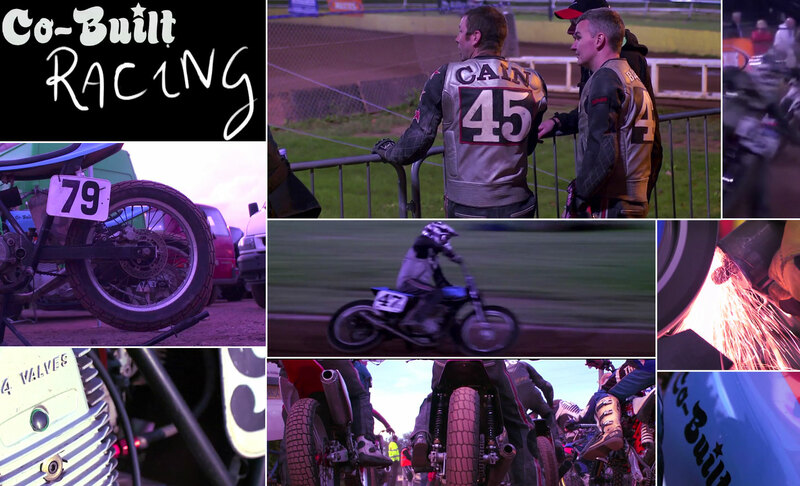 Since 2008 when we all had our first go at riding flattrack at a shorttrack experience day. How do you guys split duties at Co-Built? What was the first bike you ever built or rebuilt? Geoff started making BMX frames back in the 90s, I first built a speedway bike from scratch when I was 14. What makes the perfect track bike? For flattrack the frame geometry is pretty important. The right head angle and the right amount of weight balanced between the wheels. Motor wise ideally something with a heavy flywheel. Our bikes are really very functional. I think that is the tact we take as we build street bikes also. I like clean uncluttered motorcycles that are about function. How long have you been flattrack racing? How big is the sport in England? I have been flattrack racing for 3 seasons now. The sport is growing in the UK. I think it has the perfect mix of action and a really nice bunch of guys having fun. What’s the technique for slowing down in flattrack racing? For flattrack racing we have a rear brake but we don’t always use them. You can scrub off your speed by sliding into the corner. Being a racer, how has that informed you as a bike builder? Best bike you’ve ever rode and why? Right now its my Co-Built I love it. But I also love the Yamaha Wr250F its a great all around off-road bike and I have shared a lot of great ties on mine. Best race you ever rode in? Myself and Geoff rode a MX sidecar at Weston Super Mare Beach race Around 2006 we ended up coming 14th out of a field of around 140 sidecars. We lost all the brakes on the first lap of the 3 hour race. It was a completely draining race and by the end we both struggled to stand! What does a good racer need to possess? In my opinion a good racer has a real mix of skills. They obviously need to ride a motorcycle fast but after that its a mix of knowledge and experience. Sometimes I see club racers who start for the first time and I fell real sorry for them because the learning curve is so steep. Not for the riding but for all the other factors that go around it. What to bring to a meeting, how to prepare your bike, your tools, your spares. The list of things you learn only through experience is endless. Favorite motorcycle film of all time? That’s easy On Any Sunday. Followed by Dust To Glory. that a film by Dana Brown. Bruce’s son. I see that Geoff, your partner, manufactures car exhausts for F1 racing? What has he brought over from “the world most expensive sport” to motor bikes? Yes by day Geoff makes pipes for most of the F1 teams. We both find F1 a pretty dull sport its far to corporate and the racing is pretty tame. I’ve never seen tools so organized in a garage, and on a white wall to boot. Actually we both have really well organized garages. Mine was in a mess the day that was filmed I was a little ashamed, Geoff is a big tool collector he likes to be completely self sufficient. Do you see yourselves as craftsmen, artists, or just some guys that know their way around a bike? I think to build a nice bike its a mixture of engineering experience and design ideas. I think we each have a little bit of all of the above. Let’s say money was no object, what bikes would you love to own and why? We both often talk about the perfect garage. Actually it would be a mix of bikes one for each type of riding we like. From watching the video with you guys at the race, you just seem to be having a blast. Is it always like that? Yep pretty much. If it wasn’t we would not go. We take some pretty long road trips so we have to have fun! Last month we drove 19hrs straight to get back from a race in Venice for work! Favorite place to grab some food and drink in your town? I actually have a favorite street in Oxford. Walton street. Great burger bar (Peppers Burgers), old cinema (Phoenix Picturehouse) and great pub / music venue (Jericho Tavern).